Gerard Doherty on show for Crusaders. Pic by Pacemaker. Gerard Doherty has spent little over 180 competitive minutes in Crusaders colours - but with that time proving more than enough for the experienced goalkeeper to feel settled at Seaview. A successful decade-plus career with hometown club Derry City across two spells punctuated by time and trophies in England and Wales has offered Doherty a seasoned viewpoint from his position between the posts. Having enjoyed Irish Cup success on his debut in a 4-1 victory over Glentoran before securing a first clean sheet towards a league defeat of Newry City AFC, Doherty is now preparing to line out against Danske Bank Premiership leaders Linfield. Given a career track record built on over 600 club appearances and double-figure medal haul, Doherty can draw on past experience to relish the challenge bolstered by a belief in the Crusaders blueprint. “I’m too long in the tooth to just sit in the corner at any club but everyone has made me feel so welcome since joining Crusaders, with a number of the players with Derry City connections obviously helping too,” said Doherty. “I could see from day one the work ethic and a changing room not old in terms of age but with a serious amount of experience. “So many players have been there and done it in the game but the manager has gone out and signed others to help keep everything fresh and moving forward. “I look around at 27 or 28 top players here all fighting for minutes and a chance to impress, so that group drive can only help create the competition for places I feel you need to achieve success. “There is a real focus within the club and, overall, in my short time as a Crusaders player I have been so impressed by the professionalism and attitude. “Within five minutes of meeting the manager I knew he meant business and was building again as you cannot stand still in football. “There is a cohesion here even with such a big squad and the standard of ability can only help sharpen your approach. “In the past I’ve seen players not able to hack the big-club or big-game pressure but there is an honesty led by Stephen that results in the right attitude shared across the whole club. “Crusaders are the defending league champions and a massive club. 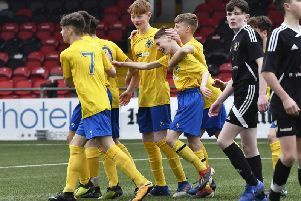 “It hit home for me on my debut against Glentoran how the boys responded to going behind and showing that desire and will-to-win to never give up. “I was disappointed to have conceded but everyone regrouped and showed the character not to lie down and accept it. As someone who appreciates the value of clean sheets, Doherty may offer grudging respect towards a Linfield defensive record of one goal conceded across the past eight appearances and five league blanks on the bounce. Three points split the sides in the standings but Linfield have enjoyed significant superiority on the pitch in previous meetings - securing an assured early-season Seaview success before December’s 4-1 home highlight. “Bring it on,” said Linfield boss David Healy on the club’s official website. “It’s a game we should relish, the players are in good form. “Crusaders have signed three or four new players so will probably change a bit from the last time we played down at Seaview and here at Windsor Park. “Crusaders are champions so the challenge is always there. “We need to be big and strong first and foremost and work hard to, hopefully, get a proper result for the football club.